This hybrid two-in-one moving head houses a high output 30W LED, along with a gobo wheel utilising 9 gobos plus open and a colour wheel with 9 dichroic colours plus open with manual focus adjustment. Adding to the functions of this unit are 3 LED rings with a total of 76 RGB SMD LEDs providing individual control with stepless RGB colour changing meteor effects. The 4 button LED menu system facilitates control via DMX, stand-alone and master/slave modes. Flicker-free projection and automatic position correction are also included. Considering purchasing the Equinox Saturn Spot? Have questions? Ask people who've recently bought one. Do you own the Equinox Saturn Spot? Why not write a review based on your experience with it. 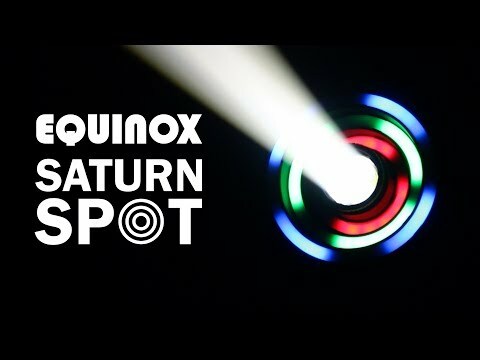 Seen a video for Equinox Saturn Spot online or have you own video? You will earn 1,200 loyalty points with this product worth £3.00, when logged in. 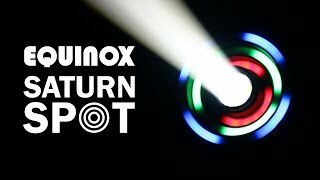 Check out Equinox Saturn Spot on DJkit.com!